I was drawn into doing a Knit-A-Long (KAL) in March for the Eden Prairie Shawl by Nancy Whitman. I couldn't help it! It's beautiful! And for some reason, I'm on a shawl kick right now. 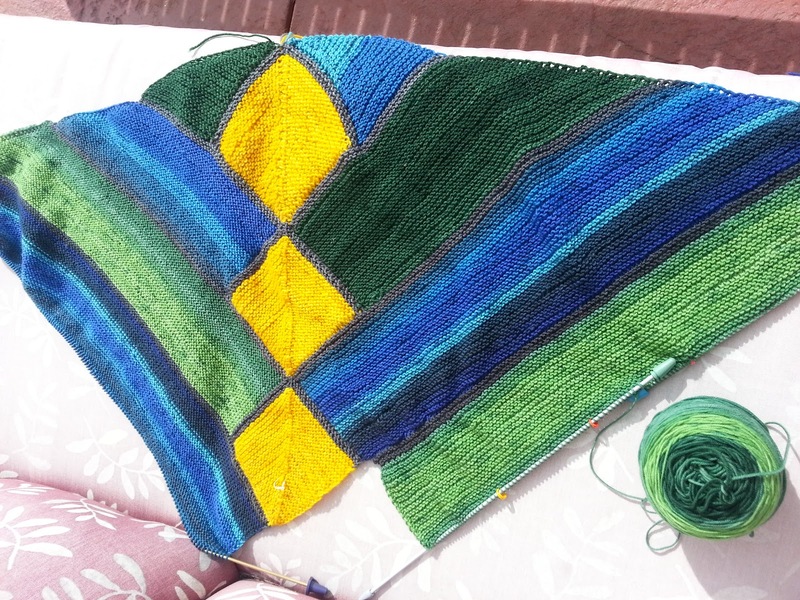 I know, it's spring, and I should be putting my knitting out of the way (yeah right!) and washing my bike and planting my garden. However, those of us in Colorado just came out of the snow two weeks ago. My bike is dirty and my garden barely planted. 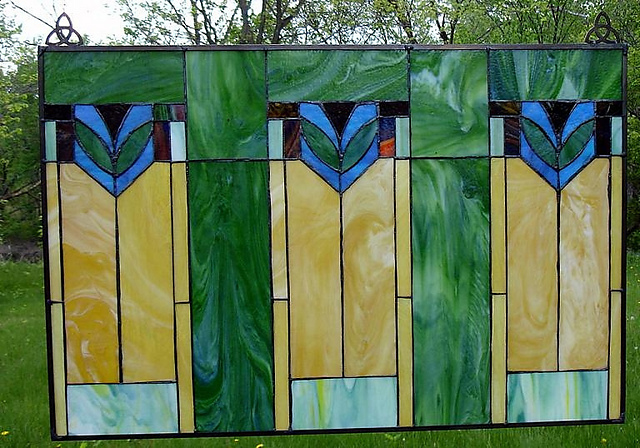 I fell in love with the Eden Prairie Shawl because I've always been a fan of Frank Lloyd Wright's designs and the Prairie school, the Arts and Crafts movement, and the Mission style. I love the idea of straight, clean lines, combined with the sweeping movement Nature provides. I immediately recognized the familiar in the Eden Prairie shawl, and had to create it. I chose a picture of a stained glass window as my inspiration, and made my color and fiber choices from there. Can you see how I'm using the slightly variegated yarn to pull out the colors of the window? I'm thinking of adding a slight "spot" of red, too, I just need to figure out how to work it in. I had a great time casting on and following along with the KAL group on Ravelry. The helpful hints and instructions for making it through the more difficult parts of the pattern came just when I needed them. I didn't finish with the group at the end of March (actually, I'm still on stripe 6), but I had so much fun I'll definitely do another KAL. I made a major mistake on where I started stripe 6, instead of picking up from the diamond, I started from the stripe end, so I took it to knit group to solicit suggestions. I was looking for ways to fix it without having to rip back. While suggestions were provided, the concensus was I wouldn’t be happy (especially with the color changes) if I didn’t rip it out. Since I didn’t have the heart to do it, Linda very kindly frogged it for me, and picked up the live stitches. MJ bought me a chocolate cookie to ease the pain. I love my knit group! I’m almost back to the row I was on before ripping out, only this time with the full stripe length! Initial start of stripe 6. Can you see where I made a mistake? 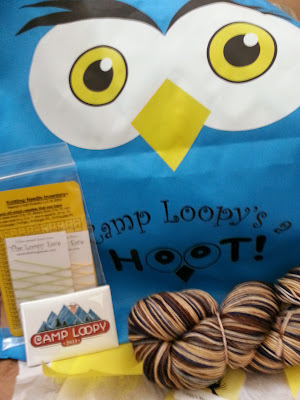 As if I don't have enough WIPs, I got dragged into joining Camp Loopy! It's a summer program offered through The Loopy Ewe in Fort Collins, CO. Project One begins on June 1st, and then a new project begins on July 1st and August 1st, finishing up at the end of August. There's prizes for everyone who finishes. Yeah! 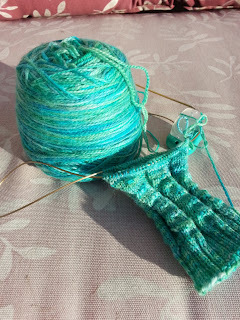 My first project is going to be the Skew sock out of Biscotte & Cie Felix in Loopy's Mountain Hike colorway. It's gorgeous! I'm swatching now, and will be casting on Saturday!